How heavy is your wet wipe use? How many packs do you get through in a week? Those soft, damp, throwaway cloths are just so useful. Whether you're changing a nappy, wiping a mucky hand or mouth or need to swipe round the kitchen for a quick tidy up, they have a multitude of uses. But they also harbour a dark secret. In today's throwaway world, it's easy to forget where those used wipes end up when they've been disposed of. But during the Marine Conservation Society's Great British Beach Clean weekend over 4000 wet wipes were found littering our beaches. That's equivalent to 50 for every kilometre of coastline. Worse still, all sorts of marine wildlife can mistake wet wipes for food, which isn't a particularly tasty thought as you tuck into your fish and chip supper. Next week, Teignmouth will welcome a Wet Wipe Monster as part of the Love Your Beach campaign to educate people about the importance of keeping beaches clean. As part of the initiative, the Marine Conservation Society is bringing Wallace the Wet Wipe Monster to Teignmouth beach to help people understand why flushing wet wipes down the toilet can have dire consequences both financially and environmentally. UK water companies spend over £81m every year dealing with over 400,000 blockages. And around 80% of these are caused by wet wipes, cotton buds and nappies. The Marine Conservation Society is currently campaigning to get wet wipe retailers to include a 'Don't Flush' message on packaging. You can sign the petition here. These startling facts got me thinking about my own wet wipe habit and have given me a kick up the backside to try and reduce my waste. I know not to flush them down the toilet, but surely the amount that must go to landfill must be pretty damaging to the environment too! I've used reusable wipes before, but laziness meant that I'm probably not using them as often as I should. As the mum of four young children, I'm not going to try and cut my wet wipe use completely. I mean, I live in the real world. But I'm going to try and use a greener option wherever possible. Although if I'm going on holiday I'll probably stick to the throwaway variety. But at home there's definitely room for improvement. You don't have to buy special reusable wipes or solutions. I actually bought some pre-loved ones a few years ago that are still going strong and I'm making more by just cutting up some old rags. You can either just dampen them with water or you could make your own solution. Alternatively, there are some pre-made solutions for reusable wet wipes available. And, as with throwaway wipes, I don't just use them for nappy changes. I've got a couple of boxes of reusable wipes dotted around the house for the odd wipe around, for dusting, for wiping sticky hands and, of course, for nappy changing. I haven't bought any new packs of disposable wet wipes for a couple of weeks and we currently have less than a third of a packet left. I'm not planning on buying anymore until we go away at the end of the month. 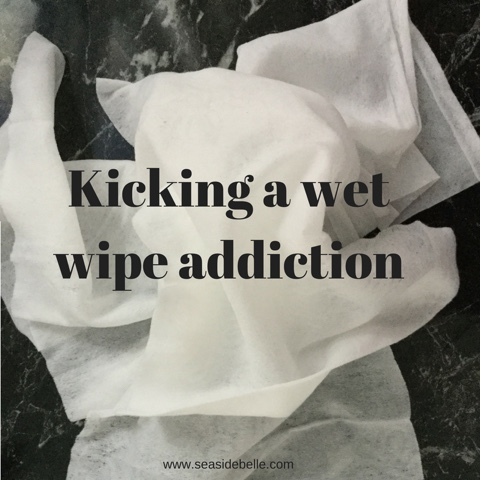 Do you think you could give up your wet wipe habit? Took me AGES to get over mine, post baby I used them to remove my make up! Now I only buy them when we go camping. I don't think I can give up on them completely yet - maybe when we potty train the youngest. But I'm definitely inspired to use the greener option whenever I can.